At the conference in honour of Stephen Mennell, about Social character and historical processes (Dublin, January 2016) Christien Brinkgreve and Rineke van Daalen (c.brinkgreve@xs4all.nl; r.m.vandaalen@uva.nl) presented the following paper, which was edited and online published in Human Figurations, July 2016. Sociological Reading of Diary Fragments, 1940-1945. For Dutch people born after 1945, like we are, the word ‘war’ means ‘The Second World War’. We grew up, knowing about that war and issues of responsibility and guilt have always confronted us; they also form the starting point of this study. How could people carry out such atrocities? How could they go on living, with such horror around them? It took West Europeans decades to answer such questions with a measure of detachment, and their answers remain continually a matter for debate. ‘The war’ also elicits ‘never again’. In the west of Europe, there has indeed been peace during the past 70 years, but elsewhere wars continued. Today the endless stream of refugees confronts us starkly with the effects of war in other, often distant countries. The present crisis suggests that your reactions and these of the people around you, are comparable to the reactions of people living between 1940 and 1945, who were confronted with the consequences of war and repression but were not directly struck themselves. Civilized people in war time: interdependencies, interactions and feelings. Norbert Elias made macro processes perceptible by studying micro processes, and at the same time his insights into broader interdependencies made interactions and feelings better understandable. In the case of the West European civilization process he researched into interpersonal behaviour standards in relation to processes of state formation. He demonstrated that the personal learning of drive and affect controls follows society-specific patterns. One may even speak of a ‘social character’ (Elias ). Processes of state formation however are not unilinear and can be interrupted. The legitimate monopoly of violence can be conquered, making the defeated subservient to the conquerors. New rules and new laws are formulated, as happened in the Netherlands during the Second World War with the exclusion of groups such as the Jews. These new behaviour rules were incongruent with prewar standards of identification and loyalty, while resistance was violently suppressed. It is within that often violent context, that we position our study. We researched into diaries written in the Netherlands during the WWII, zooming in on the ways our diary writers contemplate and explain their own experiences. We want to know how they deal with the radical changes in their daily lives, within the context of changing power relations which resulted from the German occupation. Our research material is stored in the Nederlands Instituut voor Oorlogs Documentatie (NIOD) and in other archives. We restricted our research to Diary fragments 1940-1945, selected by the NIOD (T.M. Sjenitzer-van Leening) and published in 1954. General difficulties of using diaries as research material hold especially for writing during war time.ii People censor themselves, out of fear and anxiety.iii On the other hand, the functions of diaries are especially articulated during war times, because of the large social transformations and the changing frames of reference in this period. In such anxious days, diary writers need their diaries more than ever in order to establish a grip on what’s going on. The use of the Diary fragments 1940-1945 has its own difficulties. Contrary to what we expected, the Diary fragments are not a plain reflection of the original diaries. Comparison shows that there are small differences, revisions which are not announced or accounted for by the editors. One example : in fragment 2 of this article it is unclear if the diary writer or his wife is travelling to Amsterdam. We will have to check the original diaries. We do not know anything about the selection of the diary fragments, and we do not pretend to give a representative image of them, but we use them as cases which can give us understanding of more general responses and coping mechanisms. We wondered how far we could come by examining the diaries with an open sociological mind, guided by some sensitizing concepts. We are in particular interested in processes of identification and dis-identification (see also: De Swaan 2014) – do loyalties shift, are new division lines defined between ‘us’ and ‘them’? And we are interested in the mechanism of compartmentalization, physically and psychologically – how does compartmentalization function as a way of coping with incongruent settings, as a strategy for living in different moral universes? Do people feel guilt and shame when they behave in ways that do not correspond with their conscience, and how do they deal with such emotions? We selected five diary fragments, because they lent themselves in particular to such a sociological reading. In the diary fragments dating from May 1940, the early days of the war in the Netherlands, one can read how people get alarmed, how they respond to their first fear, when existing social relations fall apart and new social relations emerge. 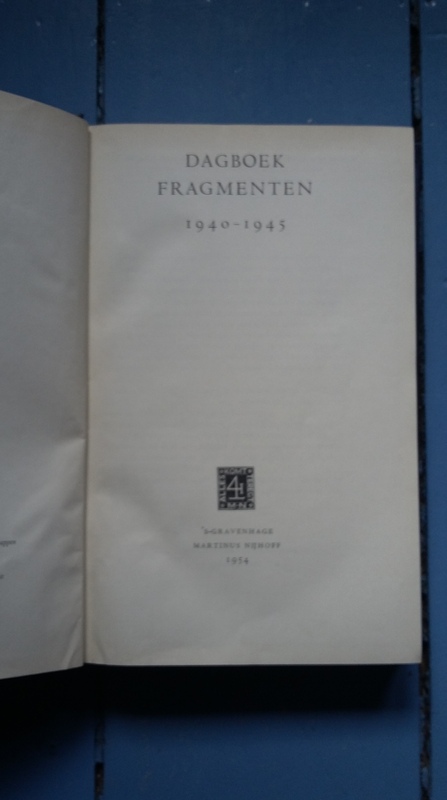 In less than five pages, a farmer, 19 year old, living in the south of the Netherlands, in Limburg, who is clearly not used to writing, gives an emotional, extensive and poetic description of his experiences during the first days of the war (Dagboekfragmenten 1940-1945, 1954: 15-19. The farmer follows his accustomed routine. He harnesses his horse, but his action is disturbed by planes flying overhead. He is still in the mood of a normal day and doesn’t think of war. The baker in his work clothes shouts to him: ‘Do you think we have war?’ The farmer laughs at him and yells back that these planes are doing an exercise. He writes down that the sun rises at 4.30, in a deep mauve and golden light. It is a beautiful sight, and high in the air the planes fly like silver birds, everything looks like a painting, says the farmer. Slowly he realizes that something is going on. Everybody is on the street, talking, discussing and shouting, trying to decide what’s going on. Later he meets a beautiful girl, with a heavily laden bicycle. ‘I feel very sorry for her, she can hardly push her bicycle. She is tired, she is probably from the besieged town of Weert.’ He wants to help her, but she becomes angry and says ‘It’s none of your business.’ She is suspicious of his intentions. The farmer identifies with her, but she doesn’t with him. He wonders what happened to her in the town of Weert. He describes more refugees from Weert as ‘a bunch of prisoners who are let loose. Nobody takes the lead, everyone has run away without planning, everyone only out for himself. […] citizens and farmers, old and young, rich and poor, everyone the same, agitated and nervous, shouting and yakkering at each other.’ He describes how former hierarchical relations fall apart, and existing social differences disappear in this new situation. The farmer writes also about the Germans. How they come along, on tanks, bicycles, motor vehicles, on horse and by foot, air planes zoom overhead. ‘A bullet hits the ground and I want to pick it up, but this German starts to scold: ‘Stupid Dutchman and spy. Just like a sermon. I curse that man in secret and I go indoors.’ It is clear: the Germans are the conquerors, the Dutchmen are defeated. The German permits himself to act in a debunking way, while the power relations do not allow the Dutch farmer to utter his anger. Comparable scenes repeat themselves. The farmer sees how a German soldier kisses a girl. ‘We are not allowed to do so, but they get the opportunity’, is his jealous remark, typical for someone who feels humiliated by people who behave as conquerors. And as witness to the new power relations, a German cannon is placed in the garden of his he farm, targeting the town of Weert. The Germans are in control. In a very short time the young farmer comes to realize that it is war. He has a keen eye for the changes in social relations, which make ordinary interactions obsolete and which ask for questioning and reflection. He encounters distrust instead of trust, rudeness, humiliation – but also solidarity. He is painfully aware that the Germans are the conquerors, and that he belongs to the besieged. He describes his feelings of embarrassment about this new subjugated position. These are no longer part of an ongoing nonreflective stream of primary emotive experience, but have to be managed by secondary acts, as Arlie Hochschild would say (2003: 88). The young farmer gradually positions himself in this new social world, making compromises and concessions, giving and taking, and in doing so creating new social relations. Fragment 2 Courage and social distance. In January 1943 the diary writer, an employee of the municipality of Veenendaal, a provincial town in the middle of the Netherlands, describes a journey to Amsterdam in order to collect a young Jewish couple who is going into hiding. To arrange such an expedition at that moment required courage. He describes the experdition in three pages (Dagboekfragmenten 1940-1945: 236-240). When a car stops, the couple wants to turn back. But their companion takes hold of them and speaks to them sternly: ‘Come on, stop being so silly, keep walking’, and the couple starts to walk again.’ The woman says that they shouldn’t talk too loudly, but the writer comments: ‘Don’t be so frightened, don’t speak so softly. But she keeps on whispering.’ The couple sees danger all around them, they are suspicious of the people they meet. The dominant emotion in this fragment is fear. Not the fear of the story teller, but the fear of the Jewish couple, which is depicted as quite exaggerated and even dangerous. The story teller creates a great distance between the behaviour of the person coming to Amsterdam, that of someone who is in control and who knows how to handle the situation; and the young couple, that is portrayed as belonging to some other category of people, as ‘them’ and as very different from ‘us’. Identification, empathy and compassion are lacking in the diary. It is difficult to give a good interpretation of this fragment, which demonstrates how assistance and denigration, support and social distance can go together. It is not clear why they help the Jews, taking risks themselves. In order to be able to discover their motives, one needs more information and one has to delve into the original diary. How is the relationship with religion? Does the relationship between the story tellers and the Jewish couple change as time goes by, and they come to learn each other better? One can read a combination of social distance and compassion in this diary. The fragment reminded us of statements we found it other diary fragments? I quote: ‘Well, it is true, Jewish people are not the most enjoyable people in the world, but that doesn’t mean that they deserve this fate.’ End quote. Are such remarks about the Jewish couple characteristic of Dutch prewar thinking about Jews? The third fragment is from a housewife who is worrying about her son who is made a prisoner of war, and complaining about the lack of food and the chilly weather. 29 June 1943. ‘When will we hear anything from him? It is bad with the vegetables, people are waiting in long queues and most of them still have nothing and it’s very expensive.’ And without a pause or change of tune: ‘Quite a few Jews went away again. I have been in their houses, it is terrible, they have to leave everything. (…) Today I had one pound of tomatoes for 50 cent at the greengrocer’. Four days later, 3 July: ‘It is still cold and chilly weather. We still didn’t hear anything from Henk (her son, CB)(…) Truus and I have been in the houses of the Jews, but there was not much to get, for the best things were already gone, such as underwear and linen, the nearest neighbours are the first to be there, I only have some little things and Truus has a scooter and some other children’s toys.’ (Dagboekfragmenten 1940-1945: 309, 310). This fragment gives a good impression of her concerns, a mixed bag of worries: her son, the lack of food. She shows some empathy for the persecuted Jews in her neighbourhood, who are forced to move, leaving everything behind. But four days later she is looking, with another woman, in the abandoned houses for things she can use herself. The empathy seems gone, or her pragmatism wins: that becomes in each case the dominant tone in her inner choir of voices. A 27 year old doctor writes to his wife (fiancée?) from the Army War Prison (Kriegswehrmachtgefängnis) in Utrecht on 1 July 1943 about his confusion after a visit from a physician, a weighty man with steely blue eyes, in uniform, covered with gold medals, accompanied by a handsome 17 -year old young man in white navy-uniform with curly dark hair, a cheeky face, ‘both in every inch correct, with a military fighting spirit. The vitality was pouring out of them.’ This upset the doctor greatly: the contrast between the starving sickly people and these strong handsome men was for him intolerable. ‘These guys: they are sitting in the sun, they have been with women (the sexuality shone from their eyes), they wage war, have weapens, are militant, able-bodied..these two handsome beasts glowing with health and virility. I was boiling. Why? Humiliation: ‘the misery of being occupied. We with our bleak faces, our thin bodies, without decorations. Invalid. (..) that these guys are going with women, are sitting in cars and waging war, but especially: that they are having it off with women, that enrages my male instinct beyond description. Especially that guy: I would like to destroy him. After this visit I was still boiling for an hour. My patients did not recognize me any more, they fell silent. And the worst thing was that I felt that the real cause of my feeling of humiliation was not these two men but my own stupid very unchristian passion. My sin was humiliating me.’ (Dagboekfragmenten 1940-1945: 314, 315). The writer of this fragment gives a clear description of the situation – the visit of the physician with his young assistant, and the sharp contrast between these strong vital men and the weak sickly bodies of the prisoners. Interesting is the shift of his emotions from anger to shame and guilt . In his turbulent inner choir of emotions – compassion, anger, passion – the feeling of sin because becomes the stronger voice. Reading and reflecting on these and other diary fragments we can’t speak of a clearly defined ‘social character’. There is great variety in ways of thinking and doing, in behaviour, feelings and morality, although the fragments show clearly the social embedding of what the writers are thinking and doing: their behaviour and reflections are ingrained in their social relations and webs of meaning, in the networks of the persons with whom they live, work and talk, with whom they identify or from whom they want to disengage themselves. Take the man who brings the Jewish couple to a hiding place. He sees a social distance between the people he rescues and the people in his own social network. His behaviour also illustrates ambivalence: he protects people from whom he disengages himself. The tone in his writings show signs of prewar antisemitism: he uses the vocabulary of the time. Or take the man who makes a trip with his family to the Betuwe, in the countryside, and is enjoying the day of relaxation and eating together, while in Amsterdam the razzia’s (round-ups) are going on. He is surrounded by his friends and family, and directs himself towards their words and behaviour and the interactions with them. This man has different tones in his words and deeds, dependent on the situation; his inner choir is multilayered. The variation in responses we found in the diaries is not wholly dependent on social position, role or habitus, on interdependencies or situations. What we see is that people are relatively autonomous in their feelings and behaviours (Elias 2012, Van Daalen, 2007a, 2007b, 2013). We do not find confirmation of Erving Goffmanns (1983) famous, deterministic adage: Not men and their situations, but situations and their men. The diaries depict people who are confronted with situational tensions, they experience ambivalence, embarrassment. They create situations in mutual contact, they continually react to each other, and in these situational contacts shape their behaviour and emotions. They play active roles in dealing with their experiences and circumstances, and have difficulties with inconsistencies in their inner life and their social relations. Then they are engaged in the complex task of emotion management (Hochschild 2003), of giving direction to the sometimes tumultuous and conflicting inner choir. People ponder about their considerations, they are selective in the things they acknowledge or deny, they distort or repress their memories and impressions. And they create borders between the different contexts in which they live, they compartmentalize their lives. A good example is the man who knows that the round ups are going on and is still capable of enjoying his day in the country with his family, the lovely weather, the ripe cherries (fragment 4). And fragment 3 shows a shift of some empathy with the Jews to a looking for useful goods in their vacated houses: the empathy is gone, the perspective is changed into an egoistic-pragmatic one. It was a partial and temporary identification, which makes place for pragmatic considerations about the usefulness of the relinquished property. Now she is with a friend or neighbour in the abandoned houses, another social situation, that influences which voice becomes dominant. Especially in turbulent times like war, people are confronted with situations and interactions which embarrass them in one way or another. The social world in which they live is no longer clear, and they have to consider their own thoughts, actions and feelings. In these circumstances they shape stories which make life bearable for themselves, they try to create harmony between the world outside and their consciences, their personality and earlier biography. These stories demonstrate how they see their experiences, and the concepts they use in doing so; how they interpret and motivate their own actions, and how they evaluate and justify their behaviour. They make a story about life and how they try to manage it, in order to get a grip on the events, and on themselves (see also: Brinkgreve 2014). Reading the fragments, one cannot distinguish sharply between black and white, between civilized or uncivilized. The picture is more complicated, more fragmented, is situationally conditioned and multi-layered, and above all more diverse. People are not made of one piece. In one situation their behaviour is empatic, in another situation they behave without any understanding of the feelings of other people. There is a variety between people, and inside people. That lack of a kind of unity makes concepts like ‘social character’ and ‘habitus’ problematic. Referring to the theme of the conference: the question is if we can speak about ‘social character’? Is there something that makes the Dutch different? The diary fragments do not enable us to answer that question. That question asks for another kind of research. Reflecting about our fragments we especially see the differences, but a comparative study could possibly discover a specific Dutch way of managing emotions, a typical Dutch habitus. If there is a notion of social character, it is perhaps in relation to how people are socialized into dealing with emotions. Our thoughts come close to Tom Inglis’s approach in his book Global Ireland (2011). In trying ‘to find out what makes the Irish different’, using sameness and difference as theoretical framework, he shows the importance of social context. ‘Individuals emphasize and play out their sameness and difference according to the social context.’ (Foreword xii). That is also our conclusion, with an accent on the importance of interactions and situations. For us, the value of a sociological reading of the war diaries lies in demonstrating the complex relationship between ideas, feelings and behaviour, resulting in a large variety in responses. Unravelling behaviour, ideas and feelings of Dutch people living during the Second World War, showing the importance of social interactions and its influence on psychic mechanisms such as repression, compartmentalization and partial and fluctuating identification, provides a better understanding not only of their responses, but also of contemporary reactions on the crises of today. Baggerman, Ariane & Rudolf Dekker 2004, ‘Inleiding’ van een themanummer over egodocumenten, Tijdschrift voor Sociale en Economische Geschiedenis, 1, 4, pp, 3-22. Blankevoort, Eefje & Anna Voolstra (red.) 2001, Oorlogsdagboeken over de Jodenvervolging. Amsterdam: Contact. Brinkgreve, Christien 2014, Vertel. Over de kracht van verhalen. Amsterdam: Atlas Contact. Brinkgreve, Christien 2014, De kracht van verhalen. De contouren van een sociologie van verhalen, farewell lecture University Utrecht. Daalen, Rineke van 2007a, ‘Paid Mothering in the Public Domain. Dutch Dinner Ladies and their Difficulties’, in: Journal of Social History, 40, 3, pp.619-634. Daalen, Rineke van 2007b, ‘Onhebbelijk in de overblijf’, in: Annet Mooij, David Bos en Sonja van ‘t Hof (red. ), Grenzeloos nieuwsgierig. Opstellen voor en over Abram de Swaan. Amsterdam: Bert Bakker, pp 47-56. Daalen, Rineke van 2013, ‘Classroom preoccupations: the shadow of the past in Dutch vocational training’, in: Human Figurations, vol. 2, no. 3. Elias, Norbert 2012 , On the Process of Civilisation: Sociogenetic and Psychogenetic Investigations (trans. Edmund Jephcott, ed. by Stephen Mennell, Eric Dunning, Johan Goudsblom, Richard Kilminster). Dublin: University College Dublin Press. Goffman, Erving 1983, ‘The Interaction Order. American Sociological Association, 1982 Presidential Address’, in: American Sociological Review, Vol. 48, No. 1 (Feb., 1983), pp. 1-17. Hengel, Mirjam van 2014, Hoe mooi alles. Leo en Tineke Vroman. Een liefde in oorlogstijd. Amsterdam: Querido. Hochschild, Arlie 2003, ‘A Feelingful Self’, in: The Commercialization of Intimate Life. Berkeley: The University of California Press, pp. 173-137. Inglis Tom 2008, Global Ireland. Same Difference. New York/London: Routledge. Sjenitzer- van Leening, T. (bloemlezing) 1954, Dagboek fragmenten 1940-1945. ‘s Gravenhage: Martinus Nijhoff. Swaan, Abram de 2014, The Killing Compartments. The Mentality of Mass Murder. New Haven/London: Yale University Press. i We want to thank Wendie Shaffer for her keen eye. ii See for the possibilities and difficulties of diary research: Baggerman & Dekker 2004. As concerns the Dutch war diaries, these were also investigated by other researchers, but we feel that this earlier research didn’t fully exploit their richness. See for example Van den Boom (2012), who observed with a partisan eye and whose analysis is rather superficial; and Oorlogsdagboeken over de Jodenvervolging, edited by Blankevoort & Voolstra 2001.